A document dated Sept. 20, 2016 shows that Turkey’s Directorate of Religious Affairs (Diyanet) asked Turkish missions and religious representatives abroad to profile Gülen movement expatriates living in their respective foreign countries. 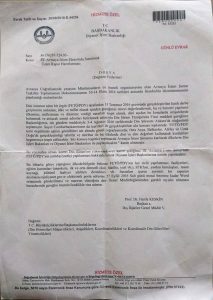 “We request that you send a detailed report about all FETÖ/PDY [a derogatory term coined by the Justice and Development Party (AKP) government to refer to members of the Gülen movement] networks, activities, educational institutions [kindergartens, primary and secondary schools, faculties, dormitories, etc.] NGOs, aid organizations, human resources, associations that host cultural activities, etc., to disiliskiler@diyanet.com.tr by Sept. 27, 2016,” said a document sent to Turkish embassies, consulates and Office of Religious Services counselors, attachés, coordinators and coordinators of religious officials’ directors. 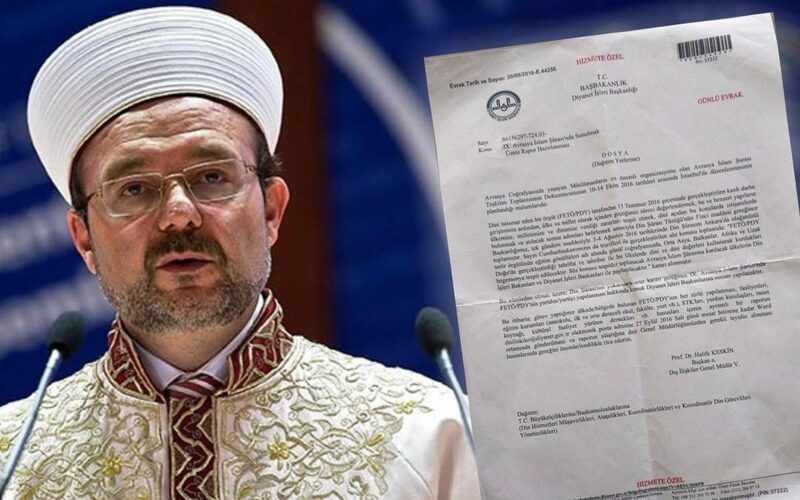 According to the document, profiling reports were asked to be ready for presentation to religious leaders who were participating in the 9th Eurasia Islamic Council, organized by the Diyanet in İstanbul on Oct. 11-14. It was also underlined in the document that the reports would be in line with decisions taken during the Religion Council that took place on Aug. 3-4 and was participated in by President Recep Tayyip Erdoğan. The document overlapped with a story published by the Hürriyet Daily News last week that said Turkey’s Diyanet had gathered intelligence from imams in 38 countries on the activities of suspected followers of the Gülen movement. In a briefing to the parliamentary Coup Commission, the Diyanet said it had gathered intelligence and prepared reports on movement sympathizers in Abkhazia, Germany, Albania, Australia, Azerbaijan, Belarus, Belgium, Bosnia and Herzegovina, Bulgaria, Denmark, Estonia, Finland, Georgia, the Netherlands, the United Kingdom, Sweden, Switzerland, Italy, Japan, Montenegro, Kazakhstan, Kenya, Kyrgyzstan, Kosovo, Lithuania, Macedonia, Mongolia, Mauritania, Nigeria, Norway, Poland, Romania, Saudi Arabia, Tajikistan, Tanzania, Turkmenistan and Ukraine. Photos of individuals with alleged links to the movement were included in some of the Diyanet’s reports, the daily said. The Turkish government pinned the blame for a July 15 coup attempt on the movement, while the latter has denied any involvement. Meanwhile, discriminatory practices and hate crimes against movement followers have surged since the putsch. Officials, religious coordinators and religious services counselors in Turkish mosques in the aforementioned countries have prepared 50 reports on the activities of movement-linked schools, businesses, foundations, associations and media outlets. The media earlier reported that sympathizers of the Gülen movement were even denied entry to mosques in Europe. At least 35 incidents this year were reported involving threats against Hizmet members in the German state of North Rhine-Westphalia (NRW) alone, Ralf Jäger, NRW’s interior minister, told Deutsche Welle in September. In the meantime, Dutch police, until early September, had investigated 150 complaints lodged by sympathizers of the movement for threats and intimidation they received on social media. A 28-year-old man of Turkish origin was also handed down a prison sentence of eight months and a fine of 23,000 euros by a French court after he attacked several institutions affiliated with the faith-based Gülen movement in the country, in September.